Comments: A couple of years after the cancellation of the weekly Savage Sword of Conan, Marvel UK tried again with the Cimmerian barbarian, reviving his title as a monthly reprinting the somewhat more mature strips from the US magazine of the same name, and intermittently featuring Red Sonja, Solomon Kane and King Kull too. The first issue was released in November 1977, and this time round the title proved to be much more successful, running for several years. With #85 it absorbed the failing Mighty World of Marvel monthly, picking up the reprints of Magik that had just begun in that title, as well as the Night Raven text strip, both of which sat somewhat at odds with the rest of the magazine. 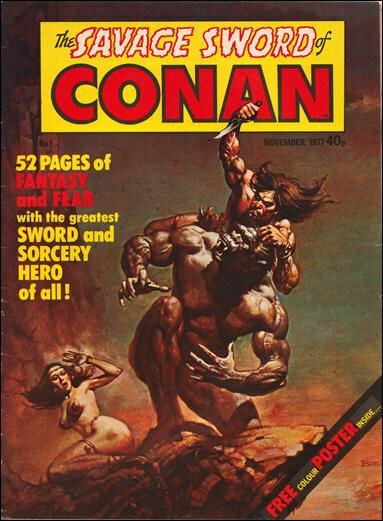 A few months later Savage Sword of Conan also came to an end in July 1985 with #93.